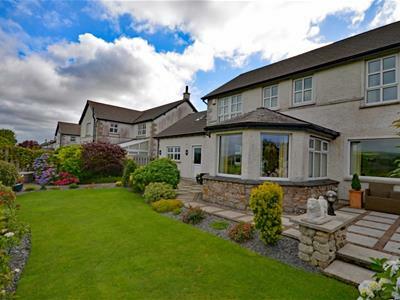 White UPVC double glazed front door has inset, opaque and leaded glazed panes, affords access from the front of this magnificent property into the spectacular hall. Side facing UPVC double glazed windows. 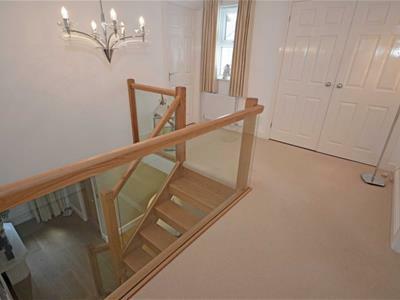 The stairs are superb, solid oak with open treads and glazed inset panels. Oak glazed doors to the kitchen and study. Matching solid oak door to cloakroom. Full glazed plate glass doors with steel handles to the living room. 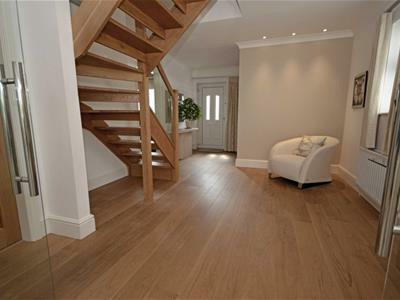 Double radiator with thermostat, three double power points, mains smoke alarm, beautiful engineered oak flooring and LED lighting. Decor of soft sheen white and feature wall. With UPVC opaque double glazed window. Fitted modern two piece suite 'Jacob Delafon' contemporary style suite with chrome fitments. Low level dual flush WC, shaped vanity basin with side surface and mixer tap. Complementary Travertine full tiling (marble effect, beige and cream shaded). Chrome vertical tubular ladder style radiator. 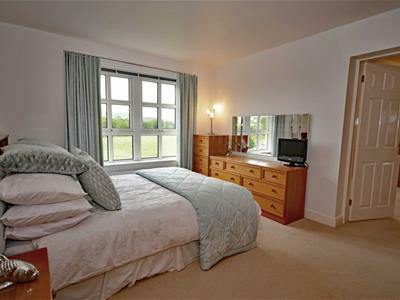 With twin aspect UPVC double glazed windows to the front and rear with stunning countryside views. A central feature is the remote operation Continental moving flame electric lateral fire. Cream shaded polished limestone plinth Four LED ceiling lights. Two double radiators with thermostats, five double power points, telephone point, two TV aerials with Sky links. Decor of a soft white, with integral plaster coving. The effective LED ceiling lights enhance the decor. Stunning open view to the rear. With the open access to both the lounge and dining area. 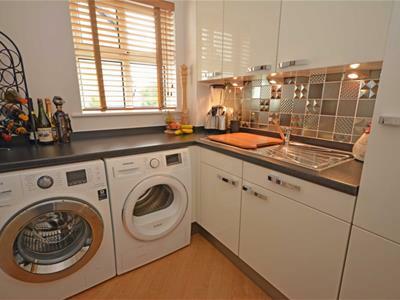 Ideal for family living. 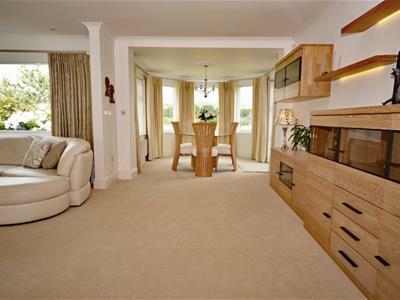 Of immaculate and stunning presentation, there is the continuing lovely decor in white with coving , cream carpeting. Two double radiators with thermostats, two double power points, telephone point and TV aerial with Sky link. Twin and fully glazed plate glass doors lead into the entrance hall. With dwarf wall, UPVC individual double glazed windows - stunning view over the open county side, further to Flan Hill, The Hoad and Lakeland Hills in the distance. Single radiator with thermostat, two double power points, TV aerial socket with Sky link. UPVC double glazed french doors to the garden. With UPVC double glazed window, faces the front aspect into the cul de sac. Quality fitted oak furniture by Neville Johnson, with study surface, glazed illuminated display cabinets, range of cupboards and drawers. 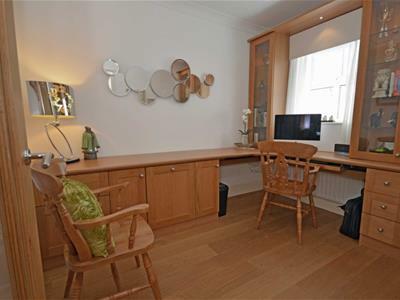 Radiator, power points, telephone point for fibre optic broadband Oak flooring. 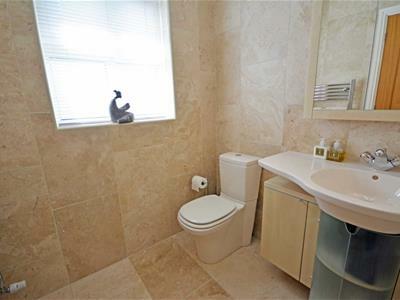 With UPVC double glazed window - superb open view to the rear. 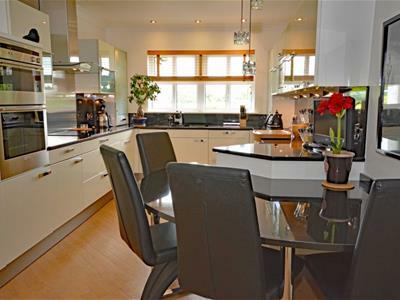 The kitchen has been fitted with a good range of modern and superior, Siematic cream gloss, base, wall and glazed display units with polished and brushed steel handles, polished black granite work surface. LED pelmet lighting. Inset stainless 'Franke' sink with bloc/chrome mixer tap and waste disposal. Modern recess tiling of black granite. Fitted Neff appliances to be included in the sale - glazed and stainless steel canopy extractor hood with fan and light. Four ring induction hob. Twin fan assisted oven with eye level grill, light and timer. Dishwasher. Integrated microwave and freezer. Miele fitted larder fridge. Radiator with thermostat, chrome faced power points, telephone point and TV aerial with Sky link. Pendant and LED ceiling lights. Bamboo shaded floor. Black granite work surface with integral breakfast bar. Colonial style doors lead to the garage and the utility room. With UPVC double glazed window, opening pane to the front. Siematic base and wall units with anthracite shaded work surface. Stainless steel sink with chrome mixer tap. Modern recess tiling in a random pattern and metallic silver shaded. Recess and plumbing for washing machine, recess for dryer and extractor fan. Integrated Neff freezer. 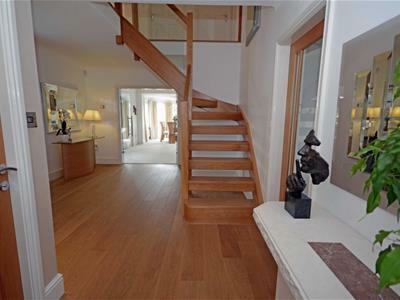 The contemporary oak, open plan staircase with treads and side glazed panels leads from the hallway and provides access to the first floor landing. With oak bannister and glazed inset panels, UPVC double glazed window. Double radiator with thermostat, one double power point and smoke alarm. Double door airing cupboard with Gledhill water tank. Feature oval ornate Adam style ceiling rose. 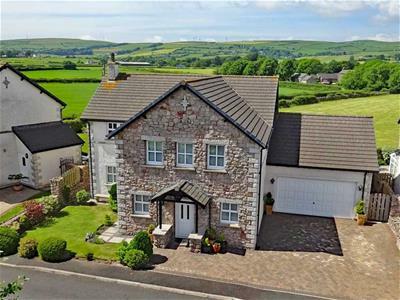 With three UPVC double glazed windows, opening panes - stunning views, over open fields, to the Fells and Lakeland Mountains. Two double radiators with thermostats, six double power points, telephone point and TV aerial with Sky link. Six LED ceiling lights. Modern fitted quality Hammond bedroom furniture, of light oak shades with Ferrani hinges. 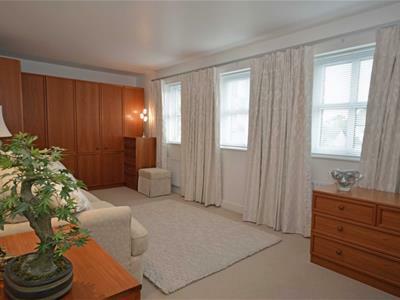 Wardrobes, bedside cabinets, TV cabinet with vertical storage and drawers. Decor of white with feature wall. Cream carpeting. UPVC opaque double glazed window, opening pane, facing the front aspect. Quality fitted four piece suite in white. Walk in shower with glazed Merlin screen. Grohe thermostatic shower with both rainfall head and flexi track spray. Low level bidet. Burghad moulded integral twin basins with chrome mixer taps, suspended low level, dual flush WC. Full tiling in white with silver patterns. Matching ceramic floor tiles. Two chrome vertical panel radiators. Extractor fan. LED lighting. With three UPVC double glazed window, opening panes - faces the front aspect - looking into the cul de sac. Two single radiators with thermostats, three double power points and TV aerial with Sky link. Four LED lights. Decor of passive white, feature wall with subtle Harlequin print, cream carpet. 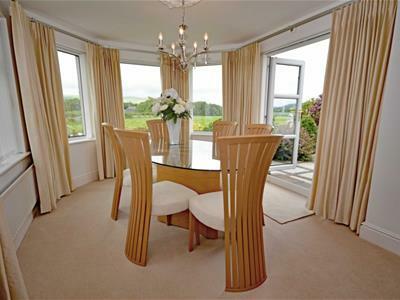 With two double glazed Velux windows, with blinds, facing the rear (and stunning views). 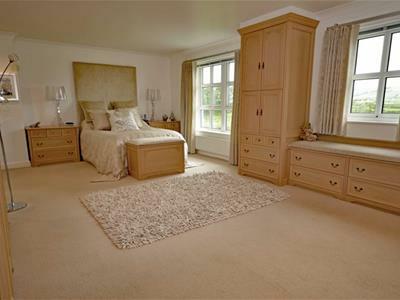 Modern quality fitted oak faced bedroom furniture, including lights and mirror doors. Double radiator with thermostat, two double power points and TV point. Inclined ceiling. Door to second dressing room 2.16m x 1.80m with UPVC opaque double glazed, tilt and turn opening window. Modern fitted furniture by Hammond with a good range of wardrobes. Radiator with thermostat. With UPVC opaque, double glazed window to the side. 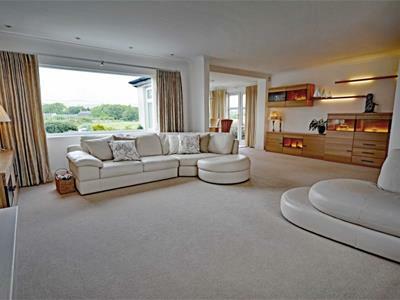 Fitted modern and superior four piece suite contemporary style suite with chrome fitments. 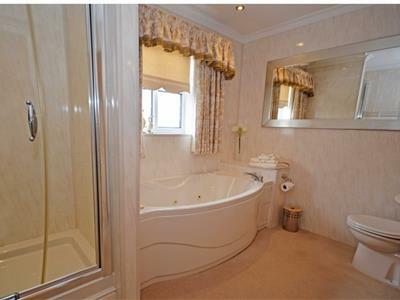 Low level, oval 'spa' bath with off set mixer tap and curved side panel. Low level flush WC with concealed cistern. Wash basin with mixer tap. 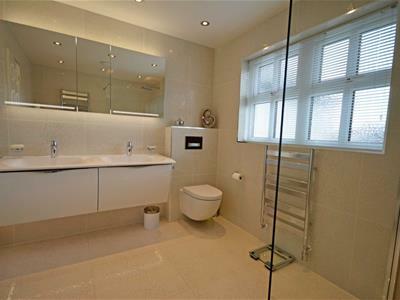 Metropolitan shower cubicle with chrome thermostatic shower with flexi track spray and glazed shower screen. Complementary cream shaded cladding. Extractor fan. White tubular ladder radiator. Pear shaded modern fitted furniture. 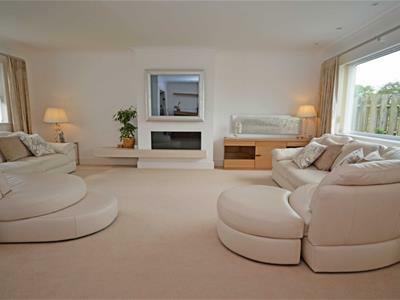 A most substantial 'Neil Price' property with a select and cul de sac location. 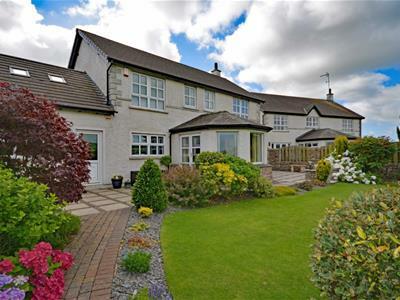 The property has a lovely front garden with lawn, planted borders and integral path. Brick paved drive for parking. Open porch to the front door. 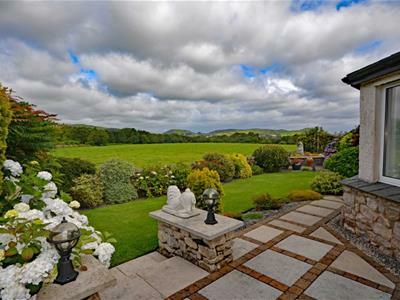 The property enjoys a highly desirable location, with open countryside and panoramic views - Viewing essential. 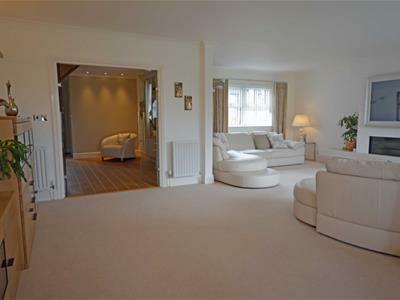 Mature established and easy maintained rear garden has two good paved areas of patio for garden furniture and recreation. Area of super lawn, borders with slate chippings and well planted. Rockery with water feature.